2012 was an amazing time to be a UX Designer. Whenever demand outstrips supply, prices go up; the current UX bubble is no exception. In fact, UX Designer is one of the few roles that’s bucking the global trend and seeing salaries rise year on year, which makes what I’m going to say next even more confusing. I spend a lot of time travelling around talking to people, and I’m amazed by the number of disgruntled UX Designers I meet—smart, talented people who are trying to make their organisations care about user experience, only to end up feeling ignored and undervalued. If we were living in a time of uncertainty, I could imagine why folks would want to stick with a secure, if somewhat unsatisfying job. However, with the UX job market so buoyant, there really is no good reason for talented UX Designers to be stuck working for old-fashioned and out-of-date organisations. 2013 is the perfect time for change. Now, it would be tempting to rush out and take the first “Head of UX” job that comes your way. However I’ve met too many people tempted by impressive-sounding job titles that look good on their CVs, only to find their careers stall. It’s important to take stock of your skills and plan your next move carefully. If you enjoy being a practitioner and want to improve your design skills, it’s difficult to do so in a company where you’re the smartest UX person on the block. Instead, I’d recommend looking for companies that really understand UX, and hire people who can mentor you and help you grow. If it really is time to move on and hone your management skills, make sure you don’t fall into the trap of becoming the head of a “UX team of one”. It can be surprisingly hard to influence corporate politics when the head of marketing or technology looks after a team of 50 while you’ve inherited a mediocre HCI graduate and a graphic designer with a marginal grasp of the web. With the Christmas holidays fast approaching, it’s the perfect time to take stock and think about how you would like your career to progress. To help you with this, here’s my four-step guide to improving your career prospects in 2013. Step 1. Undertake a quick personal skills audit. A good way to do this is to map out your skills on Warren Hutchinson’s UX quadrant model. Be honest—the only person you’re kidding is yourself. When to do it: Tonight. Step 2. Give your CV a spring clean. You’re a UX designer, so create a CV that is well structured and presents a clear synopsis of your skills and experience. Remember that CVs are used to whittle out unsuitable candidates, so don’t give the recruiter any excuse to say no! When to do it: This weekend! Time required: Half a day. Step 3. If you don’t have one already, you absolutely must have a UX portfolio. This is the tool you use to prove you can do all the amazing things it says on your CV. So include diagrams, sketches, prototypes, photos of you leading workshops—anything else you think could be useful. Don’t have this stuff? Start collecting it now! When to do it: Between Christmas and New Year. Time required: A day or two. Step 4. Send all this stuff to a good UX recruiter, and explain the type of job you’re looking for. If there are any start-ups or agencies you’ve always fancied working for, don’t be afraid to contact them as well. When to do it: Early January. Time required: An evening or two. I’m always surprised how much effort we put into designing things for other people, and how little time we allow for ourselves. So I want you to make a pledge that 2013 will be the year you design your way to a new career. 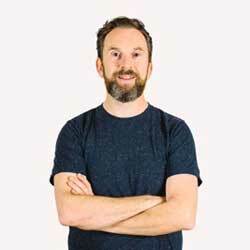 UX Designer and CEO of Clearleft, Andy curates the Leading Design and UX London conferences and helped set-up The Brighton Digital Festival. Andy is a regular speaker at international conferences like SXSW, An Event Apart and The Next Web. Never happier than when he's diving some remote tropical atoll, Andy is a qualified dive instructor and retired shark wrangler.